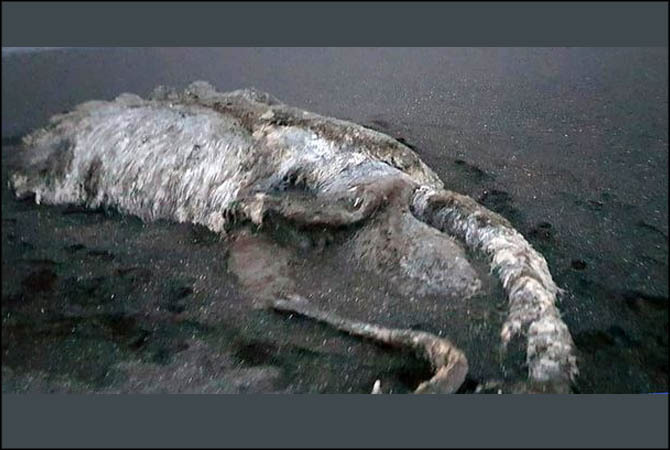 Mystery as huge ‘Sea monster’ washes up on Russian beach. A mysterious giant ‘hairy sea monster’ has washed up on the eastern coast of Russia and has left locals completely baffled. Locals have speculated that it’s a bizarre primeval relic from the deep or an extinct woolly mammoth released from an undersea permafrost grave by the warm summer. However, a marine scientist says it could be part of a whale. The ‘monster’ was too heavy for locals to move after it was found on the Pacific coastline of the Kamchatka peninsula, near the remote village of Pakhachi, according to The Siberian Times. Locals have failed to identify the ‘strange creature’ and are appealing to scientists to name the ‘baffling behemoth’ found on a beach. After inspecting the “stinking” monster, she likened it to a vast “hairy octopus”. Svetlana reported that locals “could not dig or pull it out”. One theory is that the beast could be a “globster”, a term coined in 1962 to describe a mysterious carcass washed up in Tasmania. Globsters may at first resemble a gigantic octopus while others may have some bones or tentacles or flippers – or even eyes – but they are not usually hairy. Many are believed to be the remnants of whales or sharks or other sea creatures that have decayed over time, and taken on bizarre shapes. Russian marine scientist Sergei Kornev, from the Research Institute of Fisheries and Oceanography, said he believes the Kamchatka monster is part of a whale. He said: “Under the influence of the sea, time and various animals, from the smallest to the largest, a whale often takes on bizarre forms.